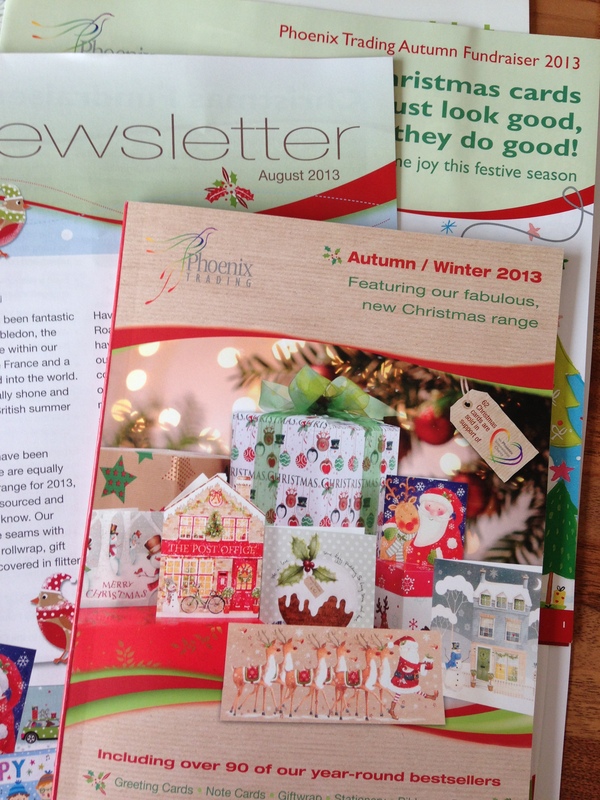 It’s that time where I get my newsletter from Head Office and get all excitable! This time is actually even better than usual, as along with the newsletter, there was an update on Phoenix Trading’s charitable support and my copy of the new Christmas supplement. Oh. My. Word. To say that I’m looking forward to this year’s Christmas season is an understatement! I always enjoy it, I love Christmas and like showing off the range to people, and as you’d imagine, traders tend to do make around 60% of our annual turnover from Sep-Nov, so you’ll see that now’s a busy and popular time for me! It’s not just the gorgeous cards, it’s the advent calendars, roll wrap, bunting, paper-chains, colour-in table cloths and decorations, gift boxes & bags, the list goes on and on…! And, of course, people still buy the everyday range – I do not stop stocking that just because Christmas is coming! At this early stage, I’m not sure which items will be most popular, but I’m fairly confident that these things will go down well..
It’s all in my shop now at www.jocelynscards.co.uk and I’m available to show it all off at parties, in person, by post or on-line – just get in touch! Anyway, I digress (easily get carried away with the new stuff!). As well as finding out about the new range, the newsletter brought me news about a new offer that Head Office are running throughout August and September. For anyone joining up as a new trader during this period, along with the £30 business kit, they’ll receive an E-Commerce website absolutely free (normally an optional extra at £25+VAT). A lovely little perk! If you can see this business being something you’d enjoy, too, find out about how you’d get started here and feel free to read any of my past posts on what I’ve been up to and what it’s all about. I enjoy welcoming new traders to my team, and am happy to help people get going and offer any support needed along the way 🙂 Ask me anything you like, and joining up is easy. You get your kit from Head Office within a few days. And that’s it – you’re in business! So, I’ve perused my newsletter, admired my brochure, I’m probably best to get on with selling it now..bye! This entry was posted in My Activities, Ramblings and tagged Business, Christmas, Direct selling, Newsletter, Phoenix Trading, Small Business, wahm on August 3, 2013 by thereadingresidence.